Nutritional disorder – phosphorus (P) deficiency. Being one of the three primary macroelements required for plant growth, phosphorus (P) deficiency symptoms develop quickly when phosphorus is in short supply. 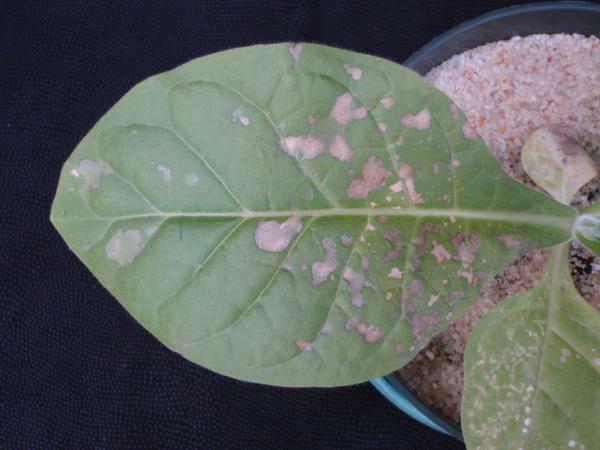 Phosphorus deficiency in tobacco begins as a noticeable stunting when compared to a plant with a sufficient supply of phosphorus (Figure 1). Additionally, a phosphorus deficient tobacco plant may develop a darker green coloration of the upper foliage. Lower leaves will become chlorotic with a mottling of olive green leaf spots (Figure 2). The initial symptoms appearing on the lower foliage may be attributed to the fact that phosphorus is mobile within plant tissues and is translocated from these older leaves to the young developing tissues under periods of low phosphorus. 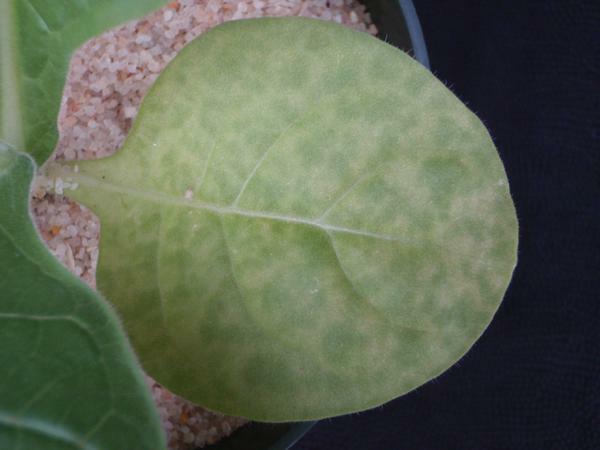 As symptoms progress, the leaves begin to develop sunken necrotic spots over the leaf surface (Figure 3). The lower leaves which were previously mottled in appearance become evenly chlorotic with necrotic spotting. These necrotic spots form first on the lower leaves and later on the younger foliage. With these intermediate symptoms, the upper foliage has an olive green appearance. Figure 5 exhibits symptoms of phosphorus deficiency in a float system. In advanced cases, the plant is still severely stunted, with the oldest leaves becoming entirely necrotic. The chlorosis and necrotic spotting works its way up the foliage with only the youngest leaves remaining green. This wide range of symptoms may be observed in the 360-degree image below (Figure 4). Figure 6 show a plant with advanced symptoms. Figure 1. The initial symptoms of P deficiency include the general stunting of the plant. Figure 2. The olive green leaf spots seen developing here on the lower leaves are commonly associated with P deficiency. Figure 3. Necrotic spotting that occurs on the foliage of tobacco is a more intermediate to severe symptom of P deficiency. Figure 5. Symptoms of phosphorus deficiency with seedlings in a float bed. Figure 4. The 360-degree view of this symptomatic plant with a severe phosphorus deficiency may be viewed by clicking on the above picture. Figure 6. Advanced P deficiency. 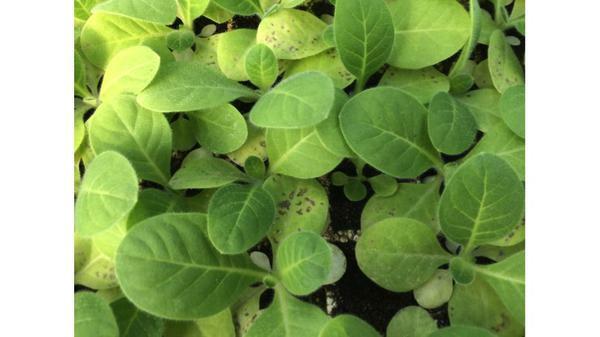 Nitrogen deficiency can also result in stunted plant growth, but in the case of limited nitrogen, the lower leaves have an overall light green to yellow coloration. Tissue analysis for nutritional concentration can assist with correct diagnosis. Good root systems and environmental conditions will aid in the uptake of phosphorus. Submit a leaf sample for nutrient analysis. Burley. 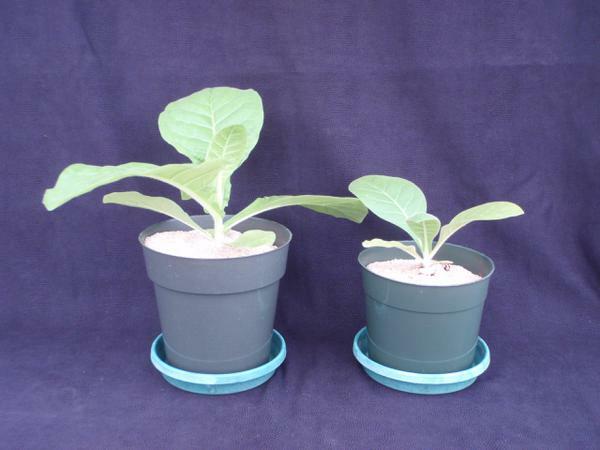 The phosphorus sufficiency range for burley tobacco is similar for all growth stages (seedlings, early growth, flowering and maturity): 0.2 to 0.5% phosphorus. The range is based on sampling the most recently mature leaves. Flue-cured. The recommended ranges for flue-cured tobacco are more refined. The phosphorus ranges based on the most recently mature leaves are: seedlings (0.2 to 0.5%), early growth (0.2 to 0.5%), flowering (0.2 to 0.5%) and maturity (0.17 to 0.5%). At harvest, sufficiency ranges for phosphorus are available for the upper leaf (0.14 to 0.3%), middle leaf (0.13 to 0.3%) and lower leaf (0.12 to 0.3%). There are no published recommendations for excessive phosphorus levels, although excess phosphorus can tie up iron (Fe) and zinc (zinc). Phosphorus availability is typically not a limiting production factor in areas with a history of tobacco production due to years of excessive application. However, soil reserves can be low in fields new to agricultural production; therefore, routine soil analysis should be used to determine nutrient need prior to production. If phosphorus deficiency is confirmed in leaf tissue after transplanting, 20 to 40 pounds of P per acre from triple super phosphate (0-46-0) banded near plants should correct the issue in most systems. More may be required in specific soil types where soil chemistry renders applied phosphorus unavailable. In most cases, where P is not truly limiting, improved environmental conditions (warmer and drier soils) will promote plant root growth and the issue should correct itself. Seedling Production. It is recommended that no more than 40 to 50 ppm phosphorus be applied to the floatbed for adequate seedling growth. Excess phosphorus will reduce seedling quality as plants will become “leggy” and spindly due to decreased stem diameter and increased stem length. Producers are encouraged to select fertilizer sources with a 2:1:2 or 3:1:3 nutrient ratio to prevent over application. Phosphorus deficiency has been observed in the float system; however, it is rare and typically occurs when fertilizer sources absent of phosphorus are applied or when the first fertilizer application is delayed beyond 15 days after seeding. Field Production. Phosphorus is not very leachable, even in sandy soils, and a good tobacco crop only removes about 15 pounds per acre (as P2O5). However, many times this amount has been applied to tobacco fields over the years, resulting in at least “high” levels of available phosphorus in about 85 percent of the fields used for tobacco. Under this soil condition, no more than 5 pounds of phosphorus in the transplant water is sufficient to promote early season growth, specifically when cool, damp soil conditions are present just after transplanting. Applying a reduced rate of phosphorus in the transplant water greatly increases phosphorus use efficiency while reducing the risk of runoff into nearby bodies of water. In addition, phosphorus continues to be one of the more expensive nutrients required for crop production in general; therefore, reduced application rates for tobacco production will also reduce the cost of a desired fertility program.